Knit gauge: 11 sts = 3” 7.5 cm and 16 = 3” 7.5 cm in St st. 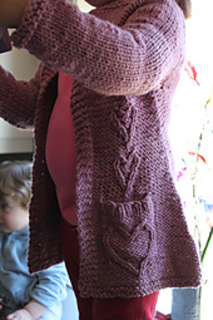 This cardigan is just the ticket! 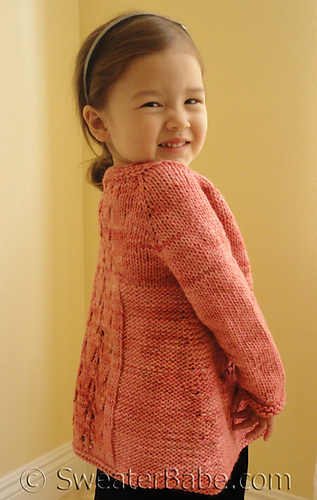 Its versatile A-line shape and top-down design will make it easily fit a child for longer than you’d think. 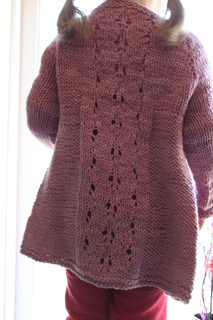 It features a nice garter stitch collar, and garter stitch front knit-in bands. Twisted stitch heart motifs run down the fronts, the largest embellishing the knit-in pockets that are great for little girls’ treasures. AND, it’s knit in Malabrigo Merino Worsted, a wonderfully soft yarn that is a joy to work with and comes in fabulous hand-dyed colors. 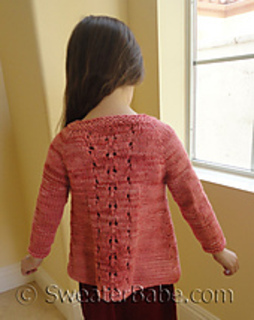 See this pattern at SweaterBabe.com for more photos, including how this same size XS sample looks smart on my 3-year old, 6-year old, and 8-year old!